Heroes VII development comes to an end..
Just 2 months after the release of the first and only expansion, an update on the official page announced the end of the partnership between Limbic Entertainment and Ubisoft, and, therefore, H7 development cycle ends too. This shouldn’t really catch anybody by surprise, considering the base game lackluster sale numbers, or the absolute non-existent promotion of the Trial by Fire expansion, which as of today has still not been reviewed either. H7 woes have been in the talk of the community since before the game started the public beta, with each of Ubisoft’s movements spilling more doubts around its eventual fate. Although it is remarkable that the support of the game has been terminated after only two months of its release, a sad record in the franchise. It is hard to imagine where will the Might & Magic franchise will go from here. After the disaster of H6, H7 was supposed to bring some form of stability to the series, but it has obviously failed. With the spin-offs released after H6 (DoC, HO, MMX) also failing to leave a mark and all but forgotten now, plus Limbic out of the picture, it would not surprise me if the M&M brand is frozen until the time for a proper comeback is due. Or it could continue releasing cheap mobile games on the chinese market, who knows. A lot has happened since I last updated here. Trial by Fire, the Heroes VII expansion focused on the Dwarf faction, has finally been released, 2 months after it was delayed for no real reason. That was soon followed by a period of little-to-no promotion from Ubisoft, just releasing little tidbits of the Fortress faction on the official page. Some fans hoped more information would be given through the pre-release Twitch session announced over one month before it would take place, but that was not meant to be. It would seem as if even Ubisoft has given up on the franchise. There is absolutely no buzz going around the expansion. Aside from the release note in the official page, there is nothing to be seen. The metacritic page is currently empty and a quick google search brought no results either. If you are wondering about the state of this expansion and what it offers, I would recommend to check out our dedicated thread in our forums, where a few fellow members are posting their impressions. It’s better than nothing, I presume! With the french publisher Vivendi looming closer and closer to an eventual takeover, one has to wonder wether we will see any more M&M games under Ubisoft’s banner (or should I say, under the current owners) at all. Heroes VII XPack - Trial by Fire - Coming out in June! A first expansion for the latest installment of the Heroes franchise has been announced. Trial by Fire will mark the return of the Fortress faction, with a lineup consisting of dwarves, beasts and...battle hamsters! Regardless, the expansion will also bring forward gameplay changes, as well as a bunch of new skirmish maps and two original story scenarios written by Terry B. Ray, Heroes IV's acclaimed writer. The expansion will be standalone, meaning the base game is not required to play it, and it will be available on June 2nd, on Uplay and Steam. Do not hesitate to share your thoughts on this on our forum. Global Alternative Creatures MOD for H7 after 1.8 Patch! After two months of no news on the Heroes VII front - quite literally - this week has seen the release of two independent updates: the 1.8 patch, accompanied by the second half of the Lost Tales campaigns, and a fan-made MOD adding alternative creatures to all factions. Sadly, the 1.8 patch is rather underwhelming, bringing minor fixes and AI changes to the game, with the use of the Wait command by the AI as the highlight...On the other hand, the second half of the Lost Tales of Axeon: Every Dog has his Day should prove to be another high-quality story. Finally, changes to the skill system are said to be released in a future update, but no details have been given as of yet. Hot from Acid Cave comes the first significant MOD created by the fans. The AC Mod is, in their own words an unofficial and global (map independent) gameplay mod for Heroes VII. Its goal is to align each faction with two more alternative creatures, which until now were neutral, and allow them to be recruitable in towns. I applaud this effort from the community, as it should give the remaining fans interested in the game something to enjoy while playing it. Feel free to post your impressions on the related HC thread. Romero launches a Piano Sonata Album Kickstarter! Ever since its inception back in 1995, music has been a key element of the Heroes franchise. Be on the Adventure map, the combat zone or the Townscreens, we have grown accustomed to these unforgettable, catchy tunes; ranging from the opera tunes of Heroes II to the epic themes of Heroes III and IV, adding an element of immersion to the game that it would hard to imagine a Heroes without them. And the man behind them was no other than Paul Anthony Romero, who is now launching a Kickstarter to release the first Heroes of Might and Magic piano sonata album & scorebook. The project has an ambitious $30.000 goal, with 20 days left to achieve it. Backers who pledge $5 or more will receive a digital copy of the album, while investing over $14 guarantees a physical copy of it. A Polish team of fans will take care of the technical aspects of the project. Heroes 5.5 RC6, Heroes VII patch 1.7 are out! A new update of magnomagus's acclaimed MOD has been published this month. 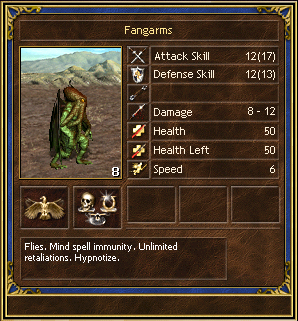 Release Candidate 6 brings major improvements to the balance of the game between might and magic hero classes. Some of the changes include mass spells ATB usage, War Machines power and balanced alternative upgrades. The later stands out as these adjustments are backed up by math in the pursuit of offering viable creature choices instead of no-brainer ones as it was the case in many of them in the original Tribes of the East release. An special shoutout goes to Deflaktor, as it is thanks to his work in reverse engineering of the game some of this changes are possible. It should not come as a surprise that the two most highly valued installments of the series, H3 and H5, have experienced very active mapmaking and modding communities even 16/10 years after their official release. There are fans who aren’t happy with the standards of the latest official releases and seek quality Heroes gameplay through other routes. Speaking of which, after being delayed twice, H7 patch 1.7 has finally been released, ending a game content drought of over 2 months. The main highlight is the first part of the Lost Tales of Axeoth campaigns: Unity, a 5-map campaign which adds plenty of Legacy artefacts, heroes, creatures and music to recreate some of the feelings of the original game. Horn of the Abyss 1.4 Available for Download! The third part of the campaign, the Horn of the Abyss. The Horn of the Abyss artifact, which revives the also newly added creature Fangarms among the living casualties in battle. The possibility of opening the hero exchange screen between heroes in a city. Small graphical improvements and bugfixes. The latest version of the MOD (1.4.2) can be downloaded from here. As always, you can ask any questions or doubts to the developers on our HC thread, and report any bug you may encounter in this one. Happy New Year, fellow heroes! Ever since the first release in May, Might & Magic: Heroes 5.5 (ongoing MOD for Heroes V: Tribes of the East) has seen the release of new versions at a frequent rate, and a lot has happened since then. Major additions such as optional Town/Dwelling Conversion or a brand new Governance system have been added to the game, as well as minor stuff like flaggable weekly resource generators or revamped Necromancy, in addition to the more mundane balance changes & bug fixes. Download links for the latest version of the game can be found here. At the same time, another patch for Heroes VII has been released. The 1.6 version adds Steam Workshop compatibility, allowing Steam users to share maps & MODs, the official tutorial map (better late than never I guess?) plus some balancing changes. But maybe most importantly it fixes the missing skills/spells bug introduced in the previous patch, which could halt indefinitely the progress on any campaign or map. The next batch of Heroes VII patches have been released, containing various, different fixes, performance improvements, a saturation rework on the Adventure Map and some new content: 12 Heroes, 2 maps and 5 additional creatures...although the five neutral creatures cannot be labelled as new, since all of them have been shamelessly recycled from H6. You can find the patch notes of the 1.4 version here, and all the content of the 1.5 version on this article. As usual, please use the current HC thread to report any bug or issue with the current version of the game. After a slow start, it seems as Limbic has finally achieved a good patching pace, with the release of 1.2, 1.2.1 hotfix, 1.3 version and 1.3.1 hotfix over the past weeks. These patches include various improvements and fixes, and while it is true the game is moving away from its terrible release state, there are still some glaring issues that need to be addressed such as multiplayer desyncs, AI intelligence or Simultaneous Turns waiting screen. For the current version (1.3.1), you can report bugs here. Furthermore, the 1.4 update is confirmed to be in the works, which is set to be released in the upcoming weeks. Sadly, I have to inform of the end of yet another Might & Magic title. Duel of Champions, the Trading Card Game that received eight expansions over the course of three years, has announced that it will not receive any additional updates. Regular service maintenances will continue to occur for "as long as we have a sufficient community of active fans". Seeing as Heroes Online has not received an update since May, one has to wonder if putting BlueByte on charge of both projects was the last nail in their coffins, or they were bound to come to an end anyway. Age of Heroes was visited by thousands of heroes in the last 24 hours. Many heroes are currently browsing. Age of Heroes is copyrighted ©2019. Heroes of Might and Magic is a trademark of Ubisoft Entertainment.